This refined and sophisticated estate is a showcase of exquisite taste and is nestled on 3.82 private acres. A set of picturesque iron doors leads you into the main residence, immediately unveiling unmatched designer touches and impeccable attention to detail. Upscale finishes throughout include elegant fixtures, soaring ceilings and cupolas, marble flooring and baseboards, interior stone walls, detailed iron work, and a state-of-the-art lighting and sound system. The entertainer enthusiast will appreciate the gracious flowing floor plan with grand formal and informal rooms, breathtaking fireplaces and a climate controlled wine cellar. The Great Room is truly the heart of this home and features sets of wall to wall sliding glass doors that cohesively blend indoor and outdoor living. The Chef's kitchen features professional grade appliances, including a Viking 6 burner gas range with a griddle, dual built-in ovens, dual warming drawers and microwave, Blue Star French Door gas oven, Sub-Zero refrigerator and freezer, dual U-line refrigerator drawers, dual Bosch dishwashers and an ice maker. Both the multi-level island and prepping station, with a vegetable sink, offers an abundance of space for catering and preparing your favorite courses. A grand circular dining room, sprawling billboard/game room with full bar, and a fully equipped commercial grade gym offers ample accommodations for comfortable everyday living or grand entertaining. The lavish, downstairs owner?s wing was designed to pamper and features a fireplace, sitting area, automatic shades, outside access and dual sided baths with separate water closet and wardrobe rooms. Two additional downstairs bedroom suites complete the main level. An ornate iron staircase leads you to an upstairs living area and dual bedroom suites. For ease when entertaining, mini-kitchenettes with sinks, dual refrigerator drawers, beverage coolers and microwaves are located throughout the home. The outdoor living and entertaining is both relaxed and exhilarating. Whether enjoying the company of a few close friends or hosting larger gatherings, the al fresco areas have been masterfully designed to orchestrate seamless indoor/outdoor living and entertaining. The grilling area is complete with a Lynx gas grill, U-line refrigerator and offers easy access to the full bar and serving station in the game room. The guest house is equally appointed like the main residence and boasts a separate entrance, two bedroom suites, living/dining area and kitchenette; providing ample accommodations for overnight guests. 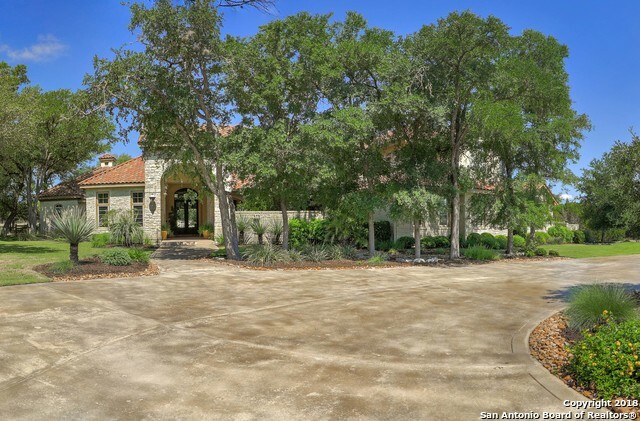 This property offers exceptional Hill Country living at its finest and is the perfect canvas for any lifestyle. *The seller is offering a $125,000 pool allowance!